Real revolutions, the ones that last, are often quiet ones. They aren’t shocking. They don’t rock the world. They just change the world so slowly that it’s only when you wake up one day and think about it, you realize the world isn’t the same anymore. What's behind Oracle's open source buys? Brazilian’s version of Helen Borrie’s book was released today by LCM publisher, the same publisher of “Firebird Essencial“. In some weeks, LCM will release the “IB Expert” book in portuguese and a new book about Firebird Security Tips (by Luiz Paulo de O. Santos). 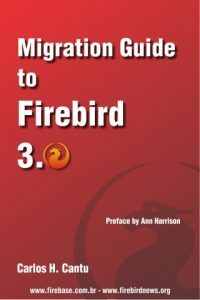 Helen’s book title was changed to “Dominando Firebird”, something like “Mastering Firebird”. The February edition of the brazilian magazine “Pequenas Empresas/Grandes Negócios” (Small companies/Great business) brings an article in the technology section that gives some tips about choosing a database. Firebird is among the listed options. As open-source databases have grown in popularity among large enterprises and small and midsize businesses alike, many CIOs have taken a closer look at the savings associated with switching to these noncommercial alternatives. Despite the attractive prices that are drawing more CIOs to open-source applications such as MySQL and PostgreSQL, traditional software Relevant Products/Services from Insight vendors have not exactly thrown in the towel. Some — including Oracle, Microsoft, and IBM — are fighting back by releasing free, scaled-down versions of their fully featured database products in the hopes that customers might one day upgrade. But the question remains: Does it make good business sense to pay for a commercial database product when well-established, open-source versions pose enticing alternatives? A growing migration away from commercial software suggests that, for many customers, it does not. Although not FB related, an interesting perspective about funding/managing an OSS project.